A yantra is a visual mantra (a verbal repitition - usually a positive affirmation). It is a symbol or icon - particulary of a goddess (devi) in geometric form. 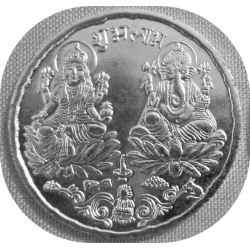 One side of this lucky coin features the popular Hindu God Ganesh, the remover of obstacles, and Lakshmi (Laxmi) Goddess of wealth. The reverse side of the coin features the Sri Yantra which is one of the most auspicious and powerful of all Yantras. Lakshmi Prapti yantra is helpful in giving complete happiness and success in life. By doing this the native is blessed with success and wealth. 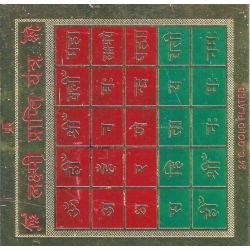 This Lakshmi Prapti yantra is very good to get rid of debts. It is said that the faithful worshipper never lacks money and material comforts for himself and his family. Lakshmi Prapti yantra is helpful in giving Complete happiness and success in life to its worshipper. This yantra should be kept in temple or pooja place at home /office . one should place it on a clean red coloured cloth. "Ya Devi Sarv Bhuteshu Lakshmirupen Sansthitha Namastasye Namastasye Namastasye Namoh Namah:"
Blessed and Energized with proper Mantras, Puja’s and Spiritually activated. It currently resides on the Altar of our Haidakhandi Temple. As you look at the yantra, allow your eyes to focus on its center. This dot in the center is called the Bindu, which represents the unity that underlies all the diversity of the physical world. Now allow your eyes to see the triangle that encloses the bindu. The downward pointing triangle represents the feminine creative power, while the upward facing triangle represents male energy. Allow your vision to expand to include the circles outside of the triangles. They represent the cycles of cosmic rhythms. The image of the circle embodies the notion that time has no beginning and no end. The farthest region of space and the innermost nucleus of an atom both pulsate with the same rhythmic energy of creation. That rhythm is within you and without you. Bring your awareness to lotus petals outside the circle. Notice that they are pointing outwards, as if opening. They illustrate the unfolding of our understanding. The lotus also represents the heart, the seat of the Self. When the heart opens, understanding comes. The square at the outside of the yantra represents the world of form, the material world that our senses show us, the illusion of separateness, of well defined edges and boundaries. At the periphery of the figure are four T-shaped portals, or gateways. Notice that they point toward the interior of the yantra, the inner spaces of life. They represent our earthly passage from the external and material to the internal and sacred. Now take a moment to gaze into the yantra, letting the different shapes and patterns emerge naturally, allowing your eyes to be held loosely in focus. Gaze at the center of the yantra on the page. Without moving your eyes, gradually begin to expand your field of vision. Continue expanding your vision until you are taking in information from greater than 180 degrees. Notice that all this information was there all along, you just became aware of it. Now slowly reverse the process by re-focusing back to the center of the yantra. Now gently close your eyes. You may still see the yantra in your mind’s eye. The patterns of creativity represented by these primordial shapes express the fundamental forces of nature. They govern the world and they govern you. Feel the loving, protective and motherly energy of the Divine. Envelopes the worshiper in Divine Light Energy. Over time, gives great boons of the Divine Mother with regular worship and mantra recitation. Chases off all dark energy. Be the personification of courage and victory—seek the blessings of Goddess Durga! She is the empowerment of divine energy who nourishes your body, mind and soul. She is a savior for women as well as a protective refuge for men. Her power rays will stimulate your courage level to achieve victory against enemies. 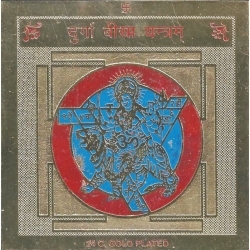 Sri Hanuman Yantra is used for power, authority, vigour and to overcome Enemies. 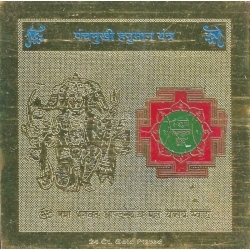 Hanuman Yantra is to appease Lord Hanuman. Beej Mantra: "Om Sri Hanumante Namaha"
Yantras are windows to the spiritual world. They are made of sacred diagrams and ancient sanskit mantra prayers. They connect directly to the realm of the represented deity. This allows you direct connection and access to the energy of the deity. How do I use a yantra? Yantras are very easy to use. After you get the yantra, place it in your sacred space, altar or any other clean place. Each day, sit before the yantra and recite the given mantra prayer. In addition, you can also offer incense or flowers to the yantra. If this is done weekly, you will get even greater benefit. 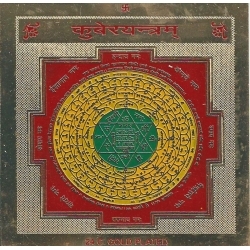 This yantra is very powerful for Lord Kuber and contains his numeric yantra in the center. It is surrounded with powerful seed mantras all around. Open your doors for riches and luxuries to step in! Welcome Lord Kubera to your home or office. When the divine treasurer walks in with heaps of money and wealth for you, he also pours happiness, peace and success into your life! Kubera Yantra is a positive energy device which is engraved with luck lines for you. This energized piece drives in an array of divine power that accumulates money, material gains and also restores back your lost wealth. Lord Kubera, the God of riches and material wealth, showers his blessings on you through this Yantra. 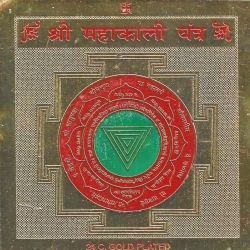 Mahalakshmi Yantra is the the auspicious yantra for Wealth and comforts in life. Devi Mahalakshmi is seated on blossomed Kamal flower. Mahalakshmi Yantra is placed in cash box, almirah, purse or in temple of your house after worship (pran pratishta). Mahalakshmi Yantra must be offered puja with cleanliness and full confidence and faith. Mahalakshmi Yantra brings success and wealth through regular puja and mantra chanting. Mahalakshmi Yantra is for the worship of Goddess Lakshmi, "the Eternal Goddess of Wealth & Prosperity". 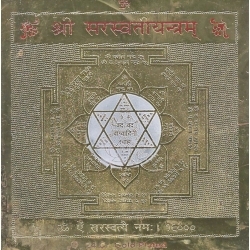 It is believed that mere "Darshan" (sight) of this unique Mahalakshmi Yantra in the morning blesses the person with Wealth. It bestows wealth, prosperity and good fortune on the worshiper. All desires are fulfilled by uttering the Mantra of this Goddess, and the worshipper is never lacking in money & material comforts - his house & treasury are always full, and he & his family never face shortage of resources. The increase in one's fortunes is a common benefit of Mahalakshmi yantra. As the goddess of wealth, Lakshmi is appealed to in order to generate money. Lakshmi is believed to honor requests made in this fashion if done with good intent. As the goddess of fertility, Mahalakshmi is employed by those wishing for children. Mahalakshmi is said to hear the appeals of those wishing to be mothers. Lakshmi is often petitioned to grant a wish the supplicant has, as long as the wish is sought with good and sincere intentions.